Creating and decorating baby’s nursery can be an exciting, fun task. However, in all the excitement, it’s easy to forget some of the more practical aspects of the room’s design. Without adequate planning, your beautiful, cozy nursery could actually end up being a potential safety hazard for your little one. 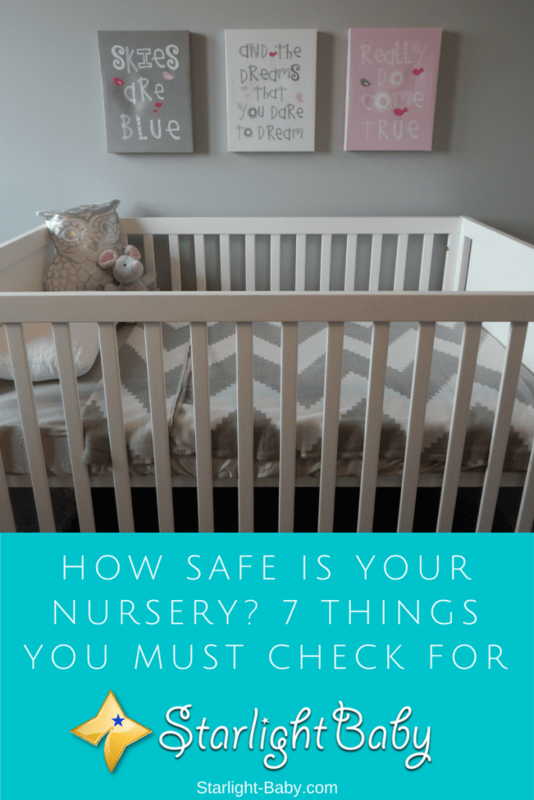 If you want to ensure your nursery is safe as well as cozy, below you’ll discover some of the main factors you need to consider. Very few parents consider the wiring and sockets in the nursery. Why would you? You use the sockets in the rest of the house daily and they’re fine so it’s safe to assume the ones in the bursary will be too right? Well, this is definitely a logical assumption, but as with anything to do with your baby, it’s always better to be safe than sorry. If your sockets are quite modern, they should come with incorporated safety features. Therefore, socket covers wouldn’t be required. In fact, adding covers can actually diminish the effectiveness of the sockets built in safety features. Not sure when the sockets were put in? Get an electrician to come out and tell you. Another socket related consideration is whether there’s enough placed around the room. If there aren’t, you’re going to need to use extensions and this further adds to your safety worries. Now when we say old paint, we’re not talking about a tub you may have left over from a few years ago. Instead, we’re talking about the room’s current paintwork and whether it was completed before the mid 1960’s. If you live in an older house, you’re going to need to know when the paint was last updated. Why? Because until the mid-sixties, paint was created with lead. When lead paintwork ends up in bad condition, a dangerous type of dust is created. So, if the paint was done in the early sixties and it is now flaking off, you’re going to need to remove it completely, rather than just paint over it. However, if it’s in good condition you can choose to simply paint over it with a modern paint. As a general rule, any houses built after 1970 should not contain lead based paintwork. However, you might want to double check just in case. It’s easy to forget about the windows when you’re decorating the nursery for a new-born. You often don’t think past the early baby stage. However, it’s something you’re going to want to address before baby arrives as it’s amazing how quickly they grow and window safety isn’t going to be high on your priority list once your baby starts crawling and walking! The window in the nursery should have a safety catch and ideally a protective screen fitted too. If there’s a curtain or blind cord, this should also be carefully placed and secured out of reach. If you have sash style windows, be sure to only open them from the top and place locks on the bottom. Any low-fitted windows should also have a safety measure installed to ensure they do not open over 12.5cm or 5 inches. Believe it or not, you’re likely going to spend a lot of time on the nursery floor with your little one. So, the choice of flooring is really important. Ideally, you’ll want to ensure it has a smooth, even surface. Carpet and hardwood floor with an area rug tends to be the most popular options. However, you may also want to consider vinyl. This is softer than laminate, yet you can buy it with a real wood effect. It’s also cheaper and easy to keep clean. Large wooden toy boxes tend to be popular not only for the amount of storage provided, but for their aesthetic appeal. However, the toy boxes which come with a lid can be hazardous for little fingers. If you want to have a toy box with a closed lid, ensure the lid is slow-closing and child friendly to reduce the risk of injury. Even if you plan on having a diaper changing table, there are still a few safety tips you’ll find useful. Changing diapers is something you’re going to be doing pretty frequently. So, you’ll want an area cleared out to give you easy access to everything you’re going to need. Diaper changing tables are ideal as they allow you to keep all of the essentials in one easy to reach place. However, it is recommended you secure the table to the wall. Even though the chances of it overturning are incredibly small, securing it gives you additional peace of mind. In fact, it’s a good idea to secure any furniture to the wall in the nursery just to be safe. The crib is where your baby is going to spend a lot of their time; particularly in the early days and weeks of their life. As tempting as it is to make the crib look nice and cozy, the best tip is to keep just two things in there. The less clutter there is, the less chance your baby has of being smothered. So, the first thing you need is a tight-fitting, firm mattress, followed by a tight-fitting sheet. That’s it, that’s all your baby needs. But won’t they get cold? Surprisingly no. Your little one has a naturally high temperature and unless the weather is particularly cold, they’re not going to need a lot of extra blankets to keep them warm. You’re also going to want to avoid using crib bumper pads. A review was actually published in the Journal of Pediatrics which discovered the risk of suffocation far outweighed the benefits of using these pads. Another tip is to ensure any mobiles used above the crib are high enough out of reach. Now, there are mobiles with toys which enable your baby to play with them, but these should only be used during playtime. Mobiles above the crib should be higher up and focus largely on soothing lights and music. Overall, it’s really important to ensure your nursery is safe as well as cute and cozy for your little one. The tips above will help you to ensure you aren’t unknowingly putting baby at risk. Do you have any additional nursery safety tips our readers might find useful? Share them below! We don’t have a nursery for our baby. The baby sleeps with his mother and father. Now that baby is 5 months old, I have often wondered about building a nursery for the baby. However, wife refuses to have a nursery. We use cloth diapers, thus we have to change diapers multiple times during the night. If the baby is kept separated from the mother, he may remain wet throughout the night. These are good tips. Hopefully, I will tackle these issues when I am ready to build a nursery. Yes, keeping your baby comfortable at night is important. I understand why your wife prefers to have the baby sleep with you because she’ll be able to regularly check if the baby’s diaper is wet or not; she wouldn’t need to get up and check the baby in the nursery. It’s convenient. Eventually though, as the baby grows up, you would need to move him to a nursery or a crib initially. I believe it would be safer to put him in a crib at night, especially when he is already able to crawl, because he may wake up in the middle of the night without you noticing it and fall off the bed. I say this for a fact because we experienced this with my oldest child. I am thankful nothing bad happened to him. From that on, the baby stayed in a crib or we sleep on a foam bed on the floor.